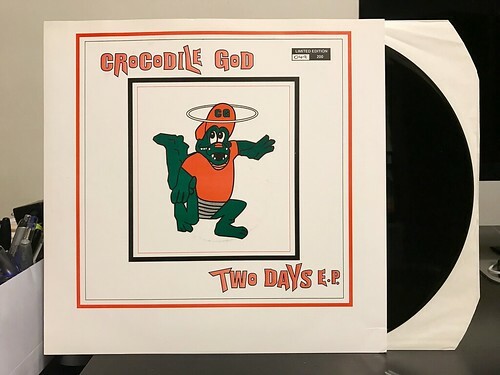 I Buy Way Too Many Records Dot Com: Crocodile God - Two Days 12"
You may remember several months ago I reviewed the 7" version of this single. That was a really big deal to me as it had been at the very, very top of my wants list for nearly twenty years. I always put more emphasis on finding the 7" version of this release, but I knew that in time, I'd need to hunt down the 12" version as well. I first heard of Crocodile God from the Best Punk Rock In England, Man compilation compiled by Sean from Rugger Bugger and released on Snuffy Smile records. That is also where I first heard of this release as in the liner notes Sean had mentioned the pressing plant did the second pressing of the 7" as a 12" by mistake. At least I assume it was supposed to just be a repressing of the 7", though maybe Mark "Guitar" Murphy can chime in with the rest of the story. Regardless, a variant was born and while it has been an interesting hunt over the years, it's pretty satisfying to finally have both in the collection. My opinion of the songs remains the same as the 7" review. Not as fully realized as their next few 7"s, but solid songs that are on the buzzsaw side of UK punky pop. I also still think the "Oi oi's" are kind of funny in "Kamarrah." But more than anything, I'm just thrilled to own this piece of my punk rock history. Croc God has a new split 7" out as well. That is currently making its way across the ocean to me, so you'll be hearing more from them soon enough.